A recent report says job-hunters are more likely to find a job over the holidays, because there’s less competition, the season puts people in a receptive mood, and all those parties and family gatherings overflow with networking opportunities. But don't forget to optimize your LinkedIn profile first. A few years ago, I got a job offer on Christmas Eve. Now, if the answers to both questions are yes, then it’s time for the softest of self-sells. Something like this—adapted to you and the specific situation—is about the best you can do. Now, many people wonder if you should also hand out your business card here. I advise against it. My rule of thumb is, never hand out your business card at a social gathering unless someone hands you his first or indicates he would like to keep in touch professionally. As I’ll cover in a moment, you have a better chance to connect anyway. Nine times out of 10, the work-related part of the conversation ends here. There will be no obvious overlap of your skill sets with their needs. So do not press the work stuff. Few people enjoy talking about their work at length with people they don’t know, especially at social gatherings. Pressing it or pitching the wrong people at the wrong time makes you look desperate and leaves a terrible impression. So don’t do it, OK? Good. Instead, simply continue chatting about other stuff. Right now, before this year’s holiday parties—perhaps while your family naps with stuffed stomachs— take some time to beef up your LinkedIn profile. Now, even if you have a 10% “holiday lead conversion rate,” we’ll call it, that doesn’t mean your new connections will turn into work. In fact, without a second point of contact, the odds are quite small. That’s where the next couple parts of your holiday networking strategy comes in. The first few things are givens: Don’t act ridiculous. Don’t drink too much. Don’t be too outspoken. And don’t break out your breakdancing moves on the dance floor. The next is a little less obvious: Right now, before this year’s holiday parties—perhaps while your family naps with stuffed stomachs—take some time to beef up your LinkedIn profile. Because when you legitimately connect with someone over the holidays—especially if you talk shop—it’s a good idea to connect with them on LinkedIn a few days later. This is your chance to reinforce the good impression you have already left. And don’t get all stalkerish. Wait two-three days, or more, and do it on a weekday. LinkedIn is today’s business card. Just as people used to obsess over their business cards, you should obsess over your LinkedIn profile. While your meeting at the holiday party is your first personal impression, your LinkedIn profile is your first professional impression. You should optimize it for the work you want and for the people you want checking it out. If you’re fortunate and outgoing enough to meet someone at a holiday party who might actually have work for you, your LinkedIn profile should be ready and waiting for that person to see it. After all, if they truly are good prospects, they will be just as eager to connect with you on LinkedIn as you are with them. If you really make an impression, they might even look you up first. Your goal is to A) make sure they can find you, and B) make sure they like what they find. But how do you do that? 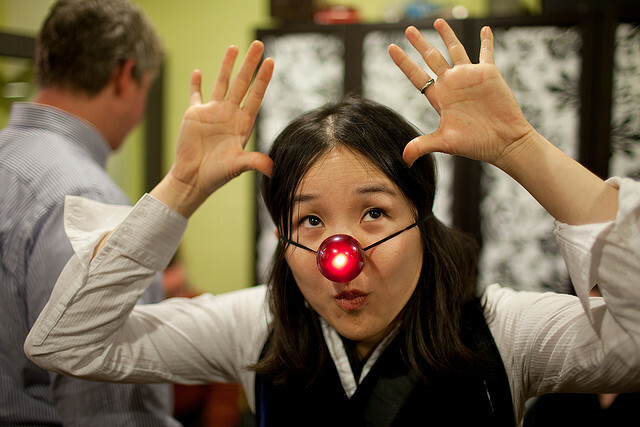 What makes an eye-catching, holiday-party-lead-converting LinkedIn profile? Thankfully, Neil Patel of QuickSprout recently created a nice infographic about How to Structure the Perfect LinkedIn Profile. Whether you’re looking for a new writing job or some extra freelance work over the holidays, or you just want to impress the creative director at your girlfriend’s/boyfriend’s/spouse’s company holiday soirée, following Neil’s advice is a great place to start. A former journalist who sold out for the less romantic but more sustainable world of online marketing, Gary created Copywriter Brands, including StuffWritersLike.com, to help writers connect with each other and the people who hire us—but also to reclaim his love for journalism and storytelling.